DARPA's new Life Support For Trauma and Transport-Lite was rolled down the ramp of an MV-22 Osprey aircraft at MCAS New River, North Carolina earlier in the month. LSTAT has been around since 1999; however, the LSTAT-lite is considerably lighter and more affordable. The basic mission of the LSTAT-lite is to bring the hospital to the Marine, instead of the Marine to the hospital. The LSTAT is a self-contained, stretcher-based miniature intensive care unit. It was originally designed by the United States Army to provide care for critically injured patients in remote areas and during transport. It contains conventional medical equipment that has been integrated into one platform and reduced in size to fit within the dimensional envelope of a standard sized NATO stretcher. Reduce weight and size through modularization, new materials; decrease batteries through intelligent power management. Redesign integration by modular configuration of all the subsystems that are hot swappable. Develop closed loop control of critical systems such as ventilator, IV fluid administration, etc. As long as DARPA is trying to make science fiction come true, they might as well aim at Larry Niven's autodoc, which first appeared in his 1970 novel Ringworld. In the story, an alien named Nessus is injured far from any hospital; how can he be treated? But they got him into the autodoc anyway. It was a puppeteer-shaped coffin, form-fitted to Nessus himself, and bulky Puppeteer surgeons and mechanics must have intended that it should handle any conceivable circumstance. 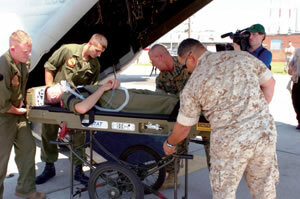 You might want to take a look at the Trauma Pod Battlefield Medical Treatment System, another DARPA project. The reference articles are here and here.